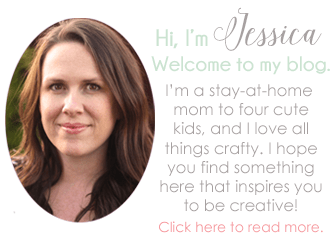 Home / Living / Home Decor / Piano Makeover Part 2: Should you paint a piano? 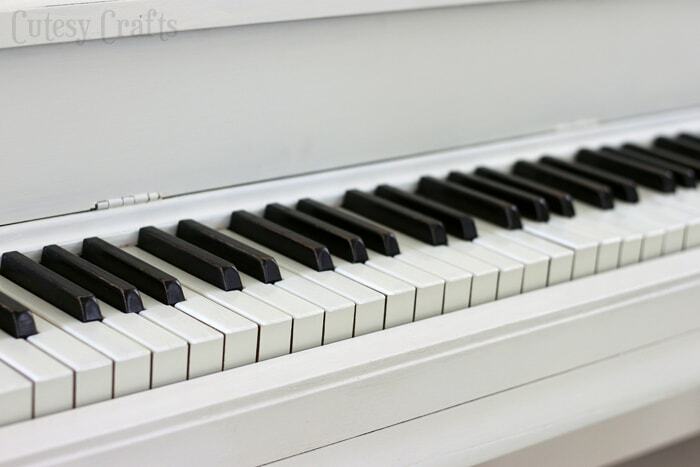 Piano Makeover Part 2: Should you paint a piano? Last week I wrote a post about things to consider before you take an old piano. The final part of my old piano makeover was to do something about the gross finish that was on it. Seriously, I think someone was using it as their kitchen table or something. There were water or food spots all over it, and when I took off the keys, you could tell someone spilled something on it at some point. Poor piano. I think the reason this piano makeover took me such a long time to start is because I didn’t know if I should paint it or not. 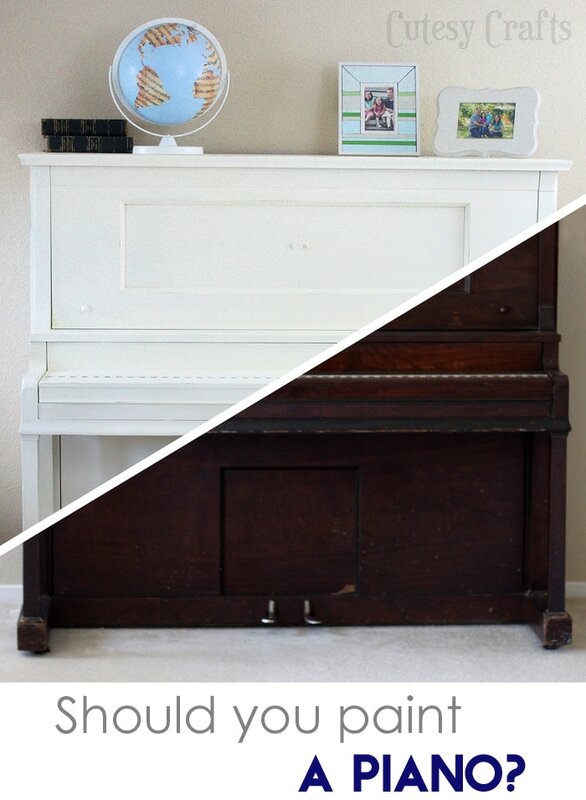 I like a good furniture makeover as much as the next person, but something about painting a piano made me hesitate. 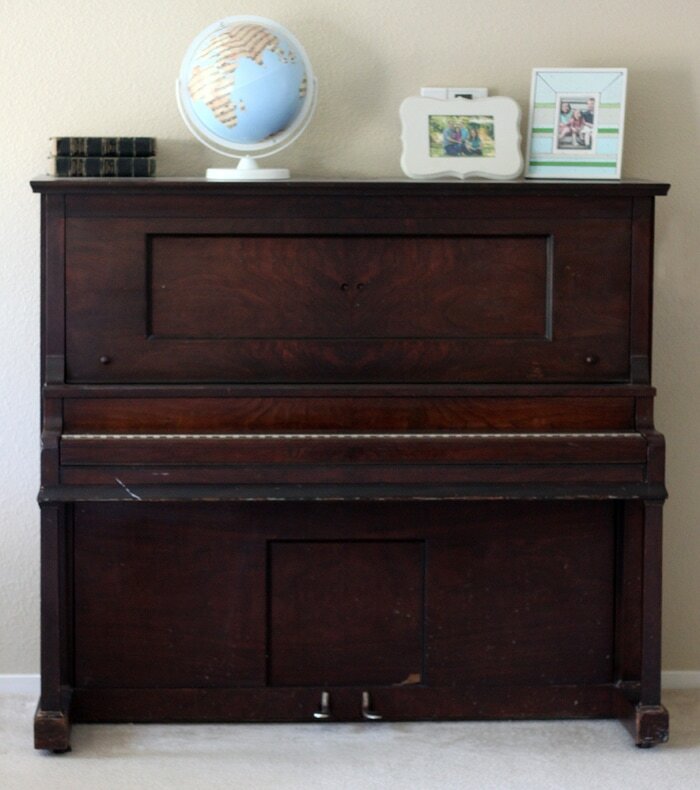 All of my other furniture would be easy to get rid of, but a piano is pretty permanent. To top it off, it is an antique piano. If you’ve ever watched Antiques Roadshow, you know that painting antiques is frowned upon. In the end, I decided that painting the piano was the best way to go. Here’s a nice before and after. I think we can all agree that it was the right choice. If not, maybe I can convince you that painting a piano is okay. Or if you are faced with the same dilemma, maybe I can help you out with some things that I have learned. A piano does not increase in value over time. 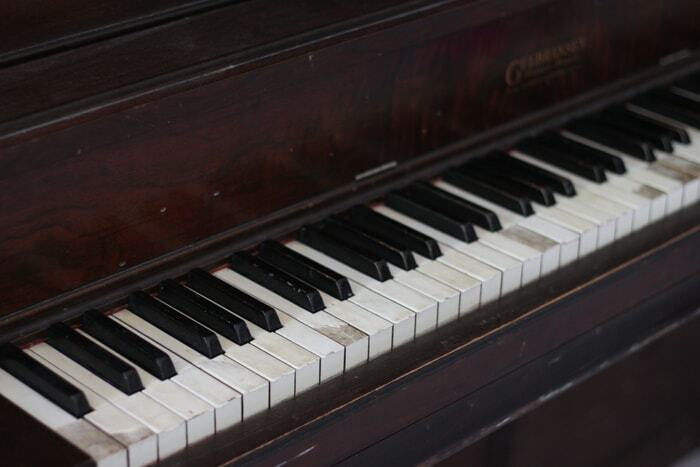 Unlike other furniture, a piano has lots and LOTS of pieces that wear out from use or even just age. Aside from a few certain brands, most “antique” pianos are not worth much in their original condition. Since it’s not worth much anyway, you are probably safe painting it. And if you are curious if the brand you have is one of those brands that might be worth more, try googling it and see what you come up with. A fully restored antique piano is a bit of a different story in terms of value, however paying someone to restore your old piano would cost you thousands of dollars. 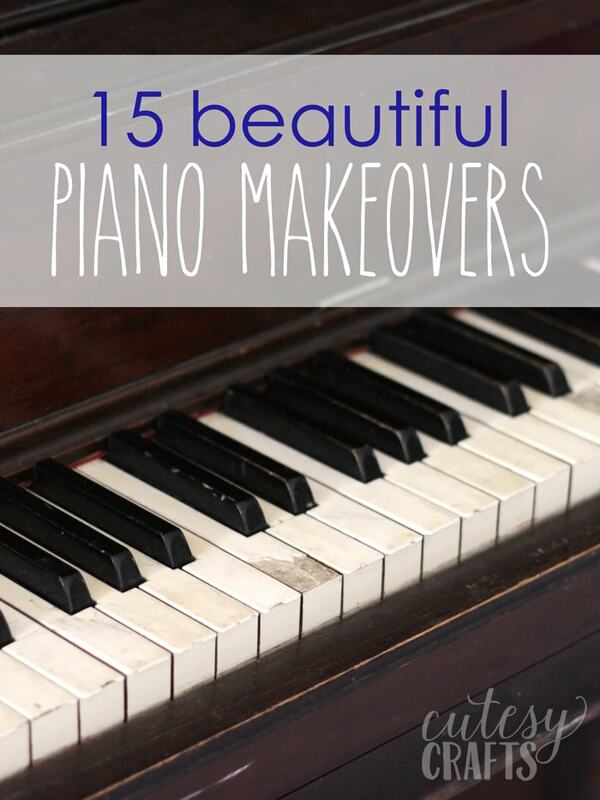 And before you go thinking you can DIY some repairs and make your piano perfect again, go back and read part 1 of this piano makeover. Unless you want to be spending a TON of time and money on parts and tools to make repairs, then it’s not going to happen. The piano strings alone would cost you a pretty penny to get replaced, and let’s not even talk about all of the moving parts. 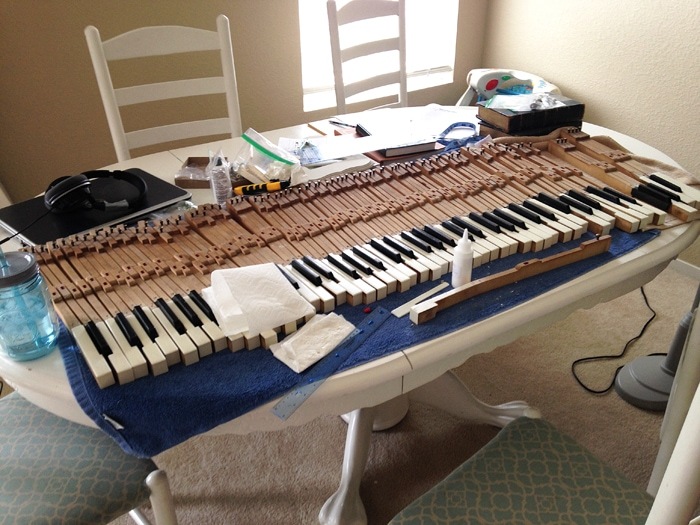 By the time you put all of that money into fixing it, you might as well just buy a new piano. Paint it. Just do it. What if your piano is newer? Should you still paint it? Well, that’s completely up to you. Like I said, it’s not going to increase in value over time. If you don’t like it the way it is, then why wouldn’t you paint it? Now, I wouldn’t go painting a brand new piano, but if you took my advice in the first post and got one from the last 20-30 years or so, I’d say you’re safe to paint it. Shouldn’t you just restore the finish on the piano? Sure, but then you’ve got to lug the thing outside or into the garage, strip it with some harsh chemicals, and then more chemicals for the staining process. I’d rather just keep the thing in the house and paint over that nasty old finish. And if your finish is still in decent condition, and you like it, then, by all means, keep it the way it is. But if that’s the case, I’m guessing you’re not reading this post anyway. So I guess what it really boiled down to for me was the value of the piano and how much I hated the current finish. It wasn’t valuable, I didn’t like it the way it was, so why not paint it? Even though I decided to paint my piano, as you can see, I was very conservative with my color (or lack of color) choice. Yes, I painted it plain old white. 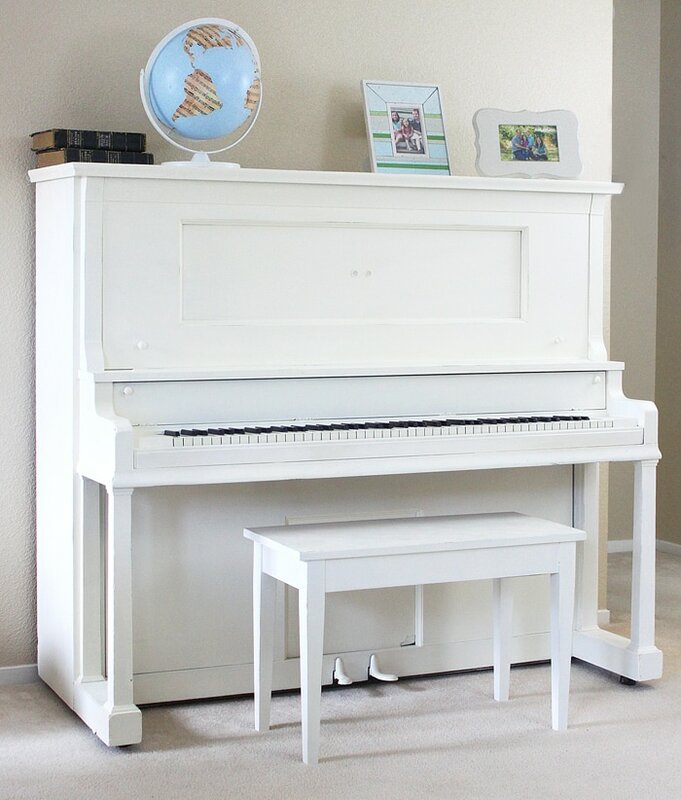 I saw lots of trendy piano paint jobs on Pinterest and even considered painting it a pretty mint color. What would have happened if just a couple years ago I painted it in a turquoise chevron pattern though? I would be so over it by now! I want to be able to enjoy the piano for at least a decade or so. If you are feeling a bit more daring, check out these other beautiful piano painting makeovers. 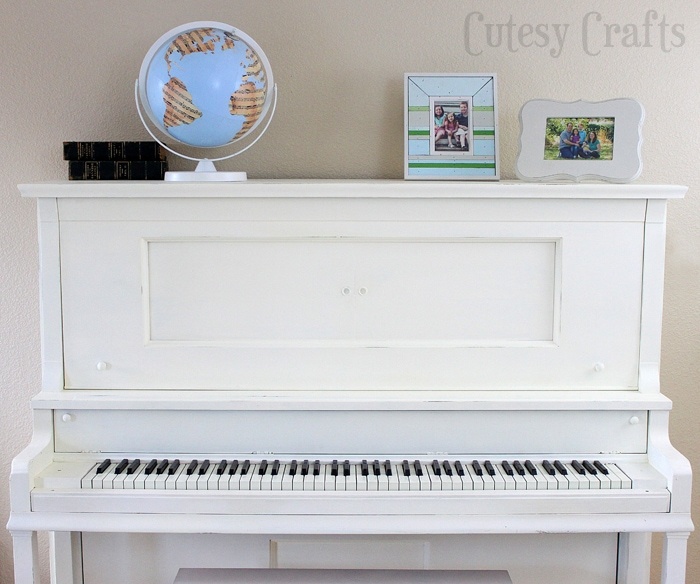 I painted the piano using Americana Decor Chalky Finish Paint. DecoArt sent me the paint for free, but I like it, so that’s why I used it. I chose a nice, creamy white color called “Lace”. This paint is nice because it requires no priming. I will say that I wish I had primed the piano before painting it white though. I’ve used this paint before on these projects here, here, and here, but none of these were white so required no primer. Since I was trying to go from a dark wood to a light white, I had to paint lots and lots of coats. Primer would have solved that issue. If you are using a different color, no need to prime though. I lightly sanded the edges to keep it looking like an antique and then went over the whole thing with a crème wax. And since I’m showing the final makeover, here’s a before and after of the keys. Don’t they look amazing?! Let me tell you, this was a PAIN to do, but I’m really proud that I did it. The original keys were real ivory, but they were all disgusting and broken. I bought some synthetic ivory keytops to replace them. 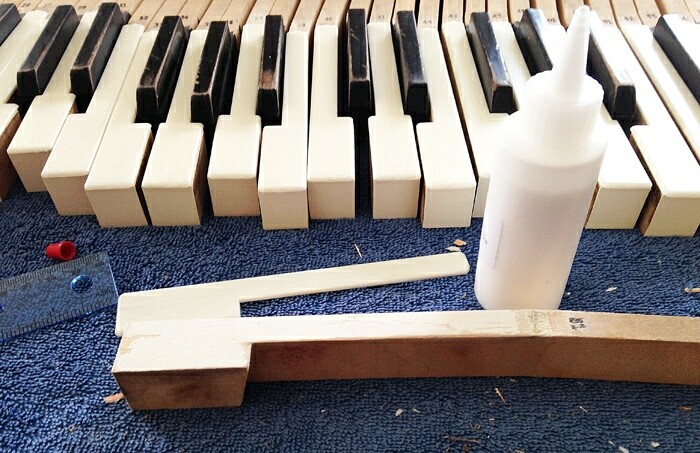 The process consisted of scraping off the old keytops with a blade, sanding off the old glue, gluing on the new keytops, and filing them all with a metal file to make them flush with the wood. I know I made that sound easier than it really was. If you’ve got a keytop or two to replace, that’s not a big deal. If you’re replacing the entire thing, be prepared for a project. 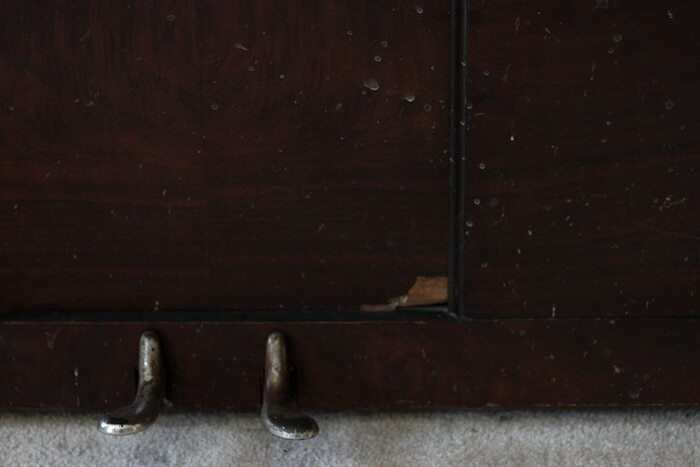 I made some other small repairs to the inside of the piano, but I won’t go into detail on those. No, it’s still not perfect (see my first post), but it’s much better than it was before. One thing’s for sure, it definitely looks better, and I’m very happy about that. I just LOVE our new/old piano! Now to invest some more into piano lessons for the kids. Someone needs to play it! Haha! 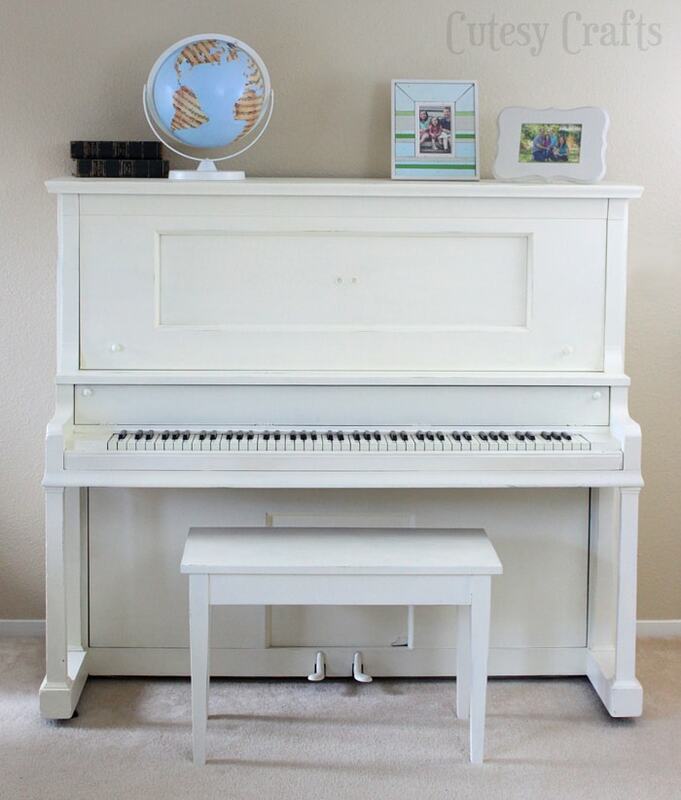 Take a look at these beautiful piano painting makeovers! 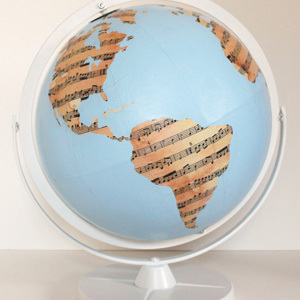 Make a sheet music globe to put on top of your piano! Hello! Your piano looks fantastic. 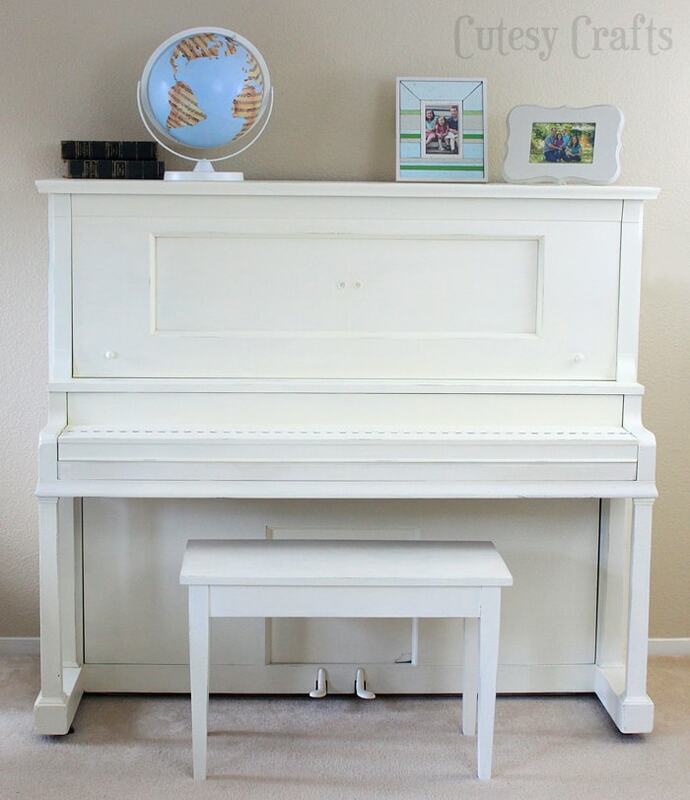 I have one I am considering painting white, but I was wondering-does painting the piano affect the sound quality at all? Thanks! The piano didn’t sound great to begin with since it’s so old and needs tuning, so I’m not really sure. I can’t imagine that it would though. IF You have ever played or ever want to play a piano, DONT paint it. Definitely does affect the sound.